Strengthening the partnership between Samoa and Wallis and Futuna is the main purpose of a meeting between the two countries in Apia this week. A delegation from Wallis and Futuna is in the country to discuss their proposal to connect to Samoa’s Tui-Samoa Submarine Cable. But that’s not all. The discussion looked at other areas to improve the cooperation between the two countries. Held at the Central Bank’s Conference room, the Minister of Communications and Information Technology and the board members of the Tui-Samoa Submarine cable were present. But Marcel Renouf, Administrator of Wallis and Futuna, said the meeting was an effective way to strengthen the partnership between the two countries. “It’s a true partnership and it’s a very good one,” said Mr. Renouf. 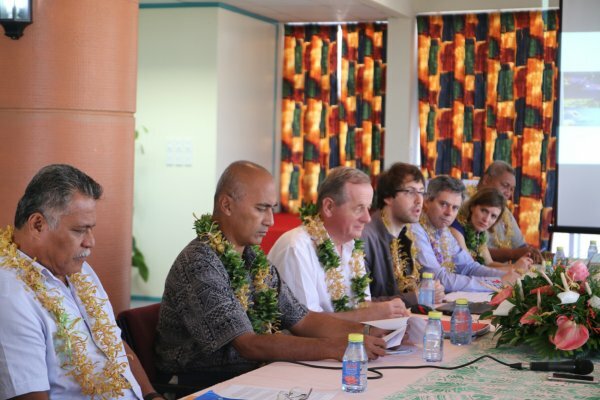 “It’s an example of cooperation between the Pacific Islands. It’s an opportunity for two countries to meet and discuss a common project and it will be very good for the development of the Islands. “I understand that in this project, we are partners. On the technical ground, we are finished with all the paper works, it’s a fair deal. Minister Afamasaga the purpose of the meeting was to get an update of the progress of the project from the two countries. “Today’s (yesterday) meeting is to get an update from both governments,” said Afamasaga. Asked if they were finalising having Wallis and Futuna connected to the Tui-Samoa Cable, Afamasaga said he was not sure. But Afamasaga said that this partnership is vital and they are very much welcoming the proposal to have Wallis and Futuna connect to our Tui-Samoa Cable. “The main purpose of the Tui-Samoa cable is for us to easy access to internet services at affordable prices and for our people to able to do business very quickly,” he said. “It’s in the same spirit why we’re welcoming the idea to have Wallis and Futuna to connect with us through this cable. It’s no business to us and it’s also no obligation to Samoa to provide this for Wallis and Futuna. But it’s in the spirit of partnership that why we’re doing this, and it’s also the goal of all the leaders in the Pacific to be able to stand together and have partnerships and be able to work together as a whole. 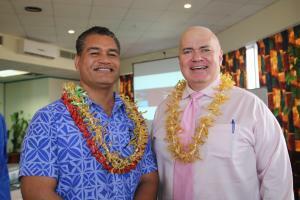 Minister Afamasaga Rico Tupa’i and SSCC Chairman, Pepe Christian Fruean. Said Afamasaga, the people of Wallis and Futuna will benefit if they connect to the Tui-Samoa Cable than us. He added that, this is not the only meeting they’ve had with Wallis and Futuna to get updates on the project. Afamasaga said the progress of the project has been going very well. “There are a lot of requirements by our funders like World Bank and ADB that we need to meet. “But those requirements are there to enable us to make sure that the whole governance of governments around the cable are done in a proper way that will protect us moving forward. As a new Minister, Afamasaga said it was not difficult for him to pick up the work on this project from the former Minister of M.C.I.T, Tuisugaletaua Sofara Aveau, who was on the post when the project and negotiation started. “The information about how this negotiation started and everything about the project was well-recorded and well documented,” he said. “So it was not hard for me to fill in and pick it up from where it was when Tuisuga was in charge. “So I just had to read through the files and get all the information I needed to know about this project. And I acknowledge the team of consultants that I work with in this project. However, Afamasaga said that the submarine cable is not the only topic on the agenda of the meeting. “It seems like Wallis and Futuna also wants to use this opportunity to talk about other cooperation in other areas,” he said. Other areas include finding ways to have flights from Wallis and Futuna to Samoa and the development of tourism, said Afamasaga. “They want to have flights that come via Wallis and Futuna to Fiji, Tonga and Samoa and some arrangements of tourism development and partnership between the two countries. That’s all in today’s agenda. “We will not concentrate on the cable but we will also talk on other areas that can strengthen the partnership between the two countries. Marcel Renouf welcomed the idea to open the discussion to other areas to improve cooperation between the two countries. “We want to develop the cooperation between of Samoa and Wallis Futuna,” he said. “In terms of airlines, we’ve always wanted to have flights from Wallis and Futuna connected to Samoa. We only have flights from Wallis and Futuna to New Caledonia, but that is far away from us and the other Pacific Island countries. “Getting here to Samoa was also a long travel for us. So we hope that in the next two years, we will be able to have flights connected to Nadi.